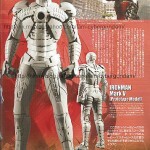 In the new issue of Hyper Hobby Magazine, courtesy of Cybergindam Blog, Hot Toys has shared a photo of their upcoming Movie Masterpiece Iron Man Mark V figure. 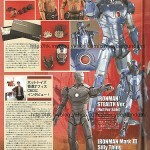 They also shared some production photos and a photo of an unreleased and never to be released Stealth Armor Iron Man. Now this might be my first Hot Toys. If only Hot Toys can make the brief case version that turns Stark in to an armor automatically, almost like 'transforming' Stark with a one push button mechanism. That would be AWESOME!!! Wishful thinking, I know. Oh...oh...oh god! 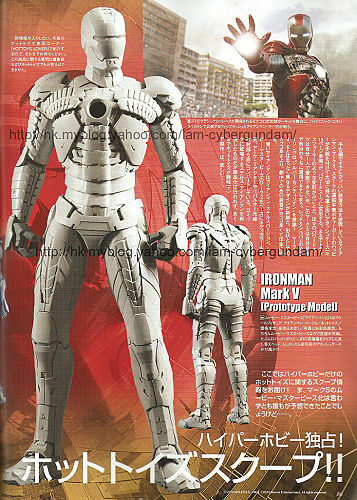 Yeah..might be picking this one up...aside from War Machine this is my favorite armor from the film! I wonder if this means a Mk VI might be seeing a release soon as well? I'm sure it will eventually. It's a distinct possibility. 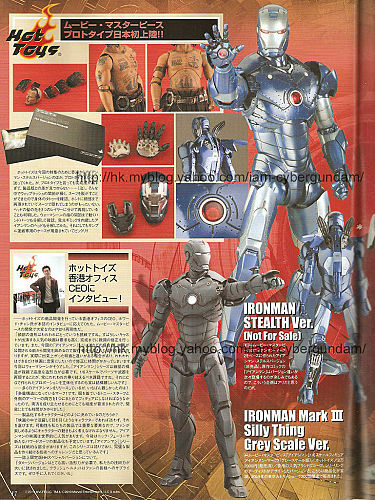 The MK VI is one of the 3 featured armors in IM2 (V and WM being the others). As for the Mark V, it looks great so far. Can't wait to see the finished pics. I'm also curious why the Stealth Armor redeco was nixed. Maybe HT feels the demand won't be there? Here, have some higher quality scans. It's obvious that the prototype is still in its early stages. It looks awesome, but is still missing a lot of details, like in the face and the stomach area. theres no doubt theyll do the mk6, in fact i was waiting for it and for sure the WM, but damn after that gets painted it could be BADASS, aslo wanna see his accessories!